Before President Nobita (center) established the band called "No Direction", he had performed the Penitensya during Good Friday, now the whole of No Direction plans to join in with President Nobita. 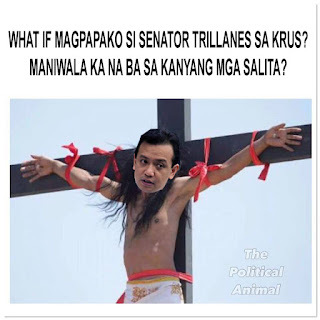 Members Pink Lacson, Doraemar Roxas, Kill Henares and Money Villar have made a vow during the Black Nazarene procession to also crucify themselves this Good Friday. "President Nobita crucifying himself was for the good of the Filipino people. Your taxes were not in vain. The President crucifying himself was proof he loves this country. Your economy is improving thanks to me and the BIR. We assure you we raised taxes to improve the economy. Now I will also crucify myself with President Nobita. I will personally see to it that our nation will progress thanks to your taxes." said Bureau of Internal Robbery Konsomisyoner, Kill Henares. "If becoming a traffic enforcer, painter, kargador or any won't help me beat Jejemon Bitay, I hope crucifying myself this Good Friday will get me the support I deserve. If President Nobita crucified himself last year, so will I. He has shown he is a good President when he crucified himself last year." said DILG Secretary Doraemar Roxas. "I lost the presidency to President Nobita. However I became a member of No Direction to prove we have put our differences aside. If Miriam Defensor Santiago placed her differences aside with Sherap Estrada, I have done the same with President Nobita. To prove my sincerity, I will join him in this year's Penitensya." said Senator Money Villar. "As a Senator, me and Money will be the first to perform the Penitensya. The Philippines should be proud to have a self-sacrificing president. The fact he is willing to crucify himself for the nation proves he's the best President we've ever had. If his parents Ninoy and Cory were alive, they would be happy to see his self-sacrifice." said Senator Pink Lacson. As No Direction vows to crucify themselves, fans are weeping tears of joy. One No Directioner said, "Wow President Nobita has done much for the country. I can feel the economy is improving. We are Asia's next miracle." Meanwhile tickets to No Direction's "Good Friday Performance" will be sold next week at the SM Mall of Asia.